In spending more time around the home, women and girls accounted for 6 out of 10 of the 4.3 million premature deaths caused in 2012 by indoor air pollution. Suhela Khan currently leads UN Women’s joint programme with UNEP, called "Women’s Entrepreneurship for Sustainable Energy Programme" in India, talks about how women’s access to clean energy and entrepreneurship can be improved in India, which is in the midst of a profound transformation in the energy sector. Eisha Mohammed, a solar engineer in Mjimwema, a remote village in Tanzania, installs and repairs solar equipment, bringing electricity to many homes in her village. She spent six months training to be a solar engineer at the Barefoot College in India, supported by UN Women and the Government of India. In post-civil war Liberia, less than 10 per cent of the population has access to electricity. Rural Liberian women, trained as solar engineers at the Barefoot College in India with support from UN Women, are pioneering efforts to provide affordable and clean energy by installing and managing solar lamps in their communities. A joint programme in Ethiopia brings together six UN Agencies to help women save and invest in energy-saving cooking stove technology cooperatives. Kimiya Umar, a 35-year-old mother of six, is one of 19,500 beneficiaries who has received entrepreneurship training, and these women also sell these stoves to other villages, benefitting more women. 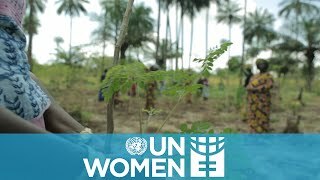 Through a grant from UN Women’s Fund for Gender Equality, a civil society organization has helped rural women form several cooperatives and taught its members how to plant a vitamin-rich tree called Moringa and how to clean, dry and sell its leaves with the help of solar technology.